The techniques used to interwork the elements of a basket vary widely and depend upon the material being used. Basic techniques include coiling, twining, plaiting, and stake and strand. 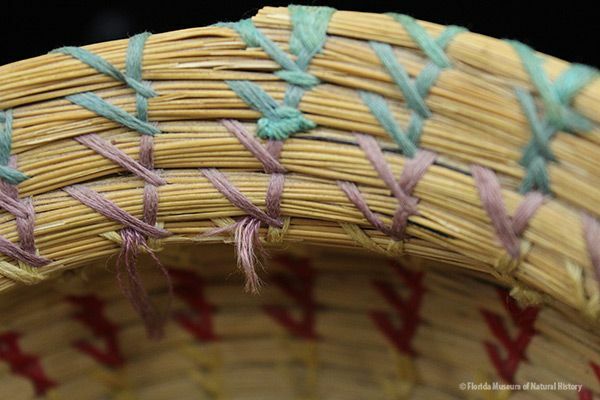 Seminole and Miccosukee baskets are made using the plaited and coiling methods. Figure 1: Basket, Miccouskee, split palmetto, 2/2 twill, 1939, 7 x 29 cm. Collected at Josie Billie’s Camp by John M. Goggin (3933-92907). The plaited technique is characterized by passing elements over and under each other at a more or less fixed angle. Comparable to weaving, plaiting produces a checkered pattern known as twill. 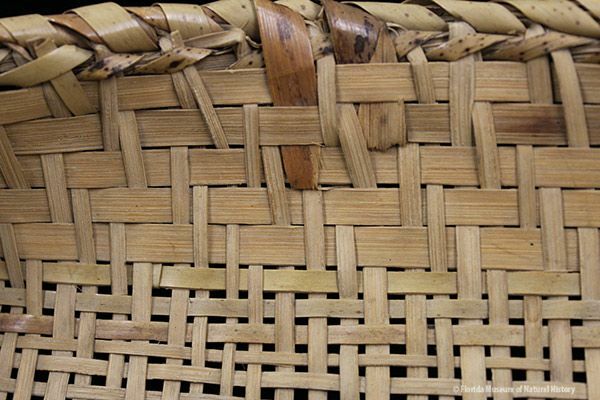 Seminole and Miccosukee plaited baskets are generally 2/2 or 3/3 twill, although some can be upwards of 4/4. For example, 2/2 means the weave is 2 over and 2 under (Figure 1). 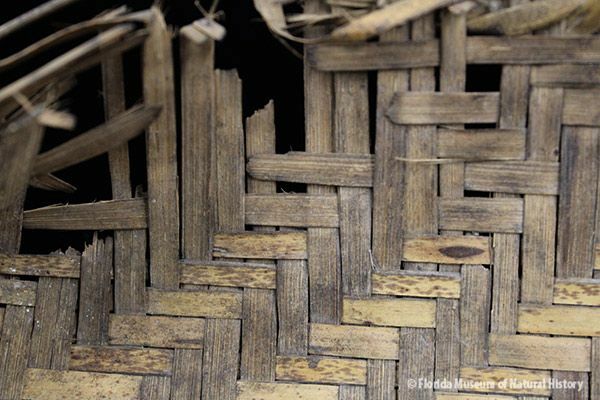 The earliest plaited baskets are made of cane or saw palmetto stems. 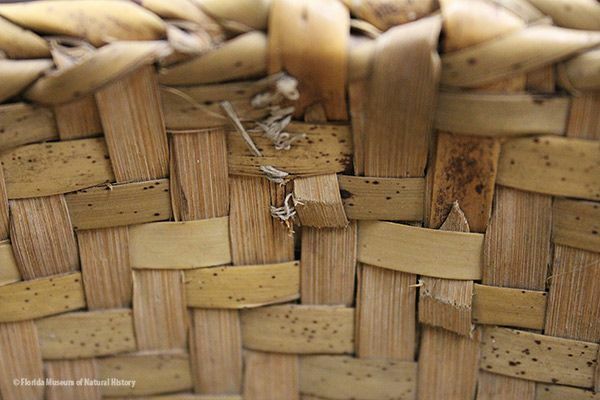 Saw palmetto (Serenoa repens) became the dominant basket making material after the Seminole and Miccosukee migrated south from Georgia and Alabama into Florida in the late 18th century. Figure 2: Photograph of Seminole basket maker, 1960. Donated by George L. Crutcher (79-8-024). Collecting palmetto stems may require a full day’s outing, and caution is necessary as rattlesnakes often bed down in palmetto aggregates. After harvesting the stems, they are stripped and dried in the sun. Once dry, stems are washed to remove debris and then dried again. 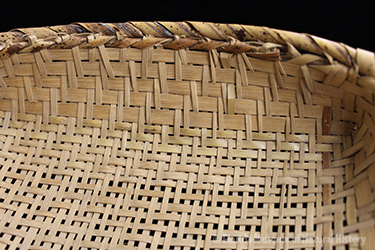 The bottom of the basket is woven first, followed by the sides and a double rim. Pack, envelope, berry, and sieve baskets are made using the plaited technique. Coiling is characterized by sewing a stationary horizontal element (the foundation) to moving vertical elements (the stitches). The stitches bind and secure the foundation and may be decorative or symbolic. 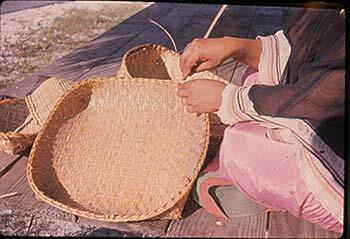 Seminole and Miccosukee coiled baskets typically have colorful thread for binding the foundation (Figure 3). 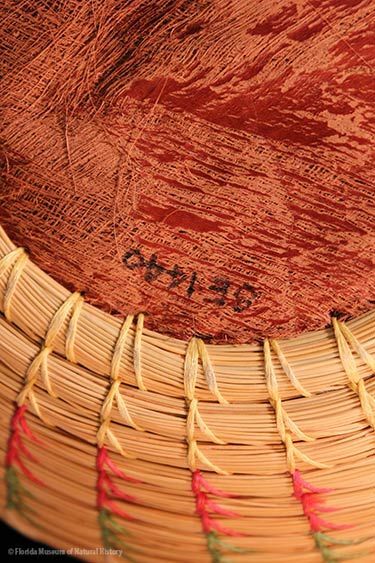 Seminole and Miccosukee coiled baskets are made from sweetgrass and/or pine needles—sweetgrass is the more popular material. Sweetgrass (Muhlenbergia filipes) is collected in the summer when chiggers and rattlesnakes are active. Unlike palmetto stems which are cut, sweetgrass is pulled up, two or three long strands at a time, until a bundle is formed. The first step in processing sweetgrass is to discard all of the dead strands. After this, the grass is washed in water, bundled, and placed in the sun to dry. 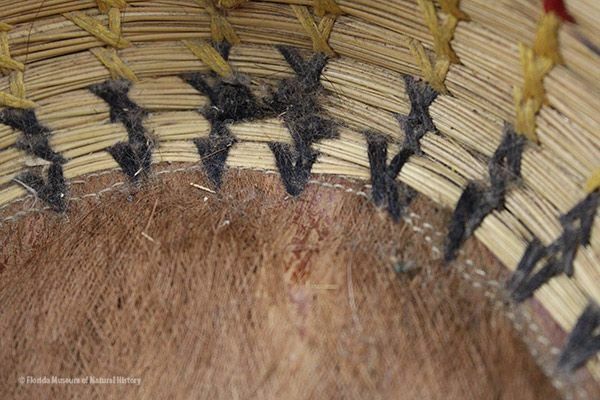 Palmetto husk is used as the base of the basket, and grass bundles (or coils) are laid down on the base and built up. The coils go clockwise or counterclockwise, depending upon whether the maker is right or left-handed. Figure 3: Basket, Seminole, sweetgrass, cotton thread, palmetto fiber, ca. 20th c. Collected in Hollywood, FL, donated by Keith and Sara Reeves (2012-46-11). Figure 4: Photograph of Seminole basket maker. Courtesy of Woodward W. Hanson (PIX-046-HFA). Basket, Seminole, sweetgrass, cotton thread, palmetto fiber, circa 20th c., 7.6 x 17.7 cm. Donated by Keith and Sara Reeves (2012-46-9). Basket, Seminole, sweetgrass, cotton thread, palmetto fiber, circa 20th c., 9.5 x 19.5 cm. Donated by Keith and Sara Reeves (2012-46-8). Basket, Miccosukee, split palmetto, 2/2 twill, 1939, 7 x 29 cm. Collected at Josie Billie’s Camp by John M. Goggin (3933-92907). Basket, Miccosukee, split palmetto, 2/2 twill, 1943, 19 x 18 x 13 cm. Collected at Big Cypress by John M. Goggin (3933-92921). Basket, Miccosukee, split palmetto. 3/3 twill, ca. 1942, 6 x 36.5 x 34 cm. Made by Ada Tiger, collected by John M. Goggin (3933-92913).